Austin, Texas is blessed with 300 days of sunshine a year, and Austinites love to take full advantage of those beautiful, sunny days. When we’re not out hitting the local trails or swimming holes, we want to bring the sunshine to us — and what better way than on the back patio? Making the most of outdoor spaces requires the right design elements. Selecting the best patio doors for your Austin home might seem overwhelming, but we’re breaking down the pros and cons of each door system. Sliding patio doors might be the best-known choice and are probably the first style you think of. Also known as gliding doors, this door system is composed of two glass panels, one of which slides open and closed along a track. Sliding patio doors are stylish, affordable, and easy to maintain. Their large glass panels let in the most natural light of all the available options. 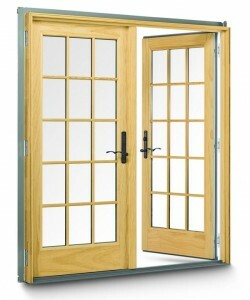 Beautiful and elegant, French doors are hinged like your front door, so they swing open and closed rather than sliding. When both doors are open, you can get beautiful, unobstructed views — if your backyard or the skyline beyond it is a feature you’d like to showcase, French doors are the way to go. While the term French doors generally refers to two hinged doors hanging side by side, you can also install a single hinged patio door or explore other possible configurations. Three swinging doors? Why not? While we don’t sell bifold patio doors, they are a third option. This door system is best for very wide spaces and uses anywhere from 2-8 panels that fold like an accordion to open. While the effect is eye-catching, these doors come with both the highest price tag and the worst energy efficiency rating. 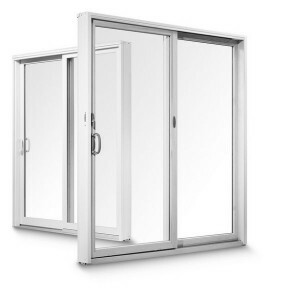 Which Patio Door Option Is Best For Me? So should you go with sliding patio doors or French doors? That can be determined by a couple of factors. How much room do you have available? Sliding doors take up a lot less space. Because French doors swing in as well as out, they limit your options for furniture placement near the door. Which style better suits your taste? Many homeowners find French doors more aesthetically pleasing. Their more traditional look might be a better fit for your home’s style and decor. This door system is also highly customizable with various options available for hardware and other design elements. Sliding patio doors often incorporate a screen option, making it easy to let air in while keeping bugs out. On the other hand, only one panel of a sliding door system opens. With French doors, both doors swing fully open, allowing more fresh air into your home. Finally, if you’re looking for the most cost-effective option, you’ll probably want to go with sliding patio doors. While various factors can affect the final price, French doors are typically a more expensive option. Which option is the most energy efficient? It seems like there should be a definitive answer, but even energy experts are divided here. Some say that the overlap offered by sliding patio doors provides greater efficiency and that the seam where French doors come together is a weak point, where energy can be lost. Others maintain that French doors are the clear winner. French doors usually have less glass (more glass lets in more heat during our long hot Austin summers) and more weatherstripping, providing a better seal against the elements. The bottom line is that with the correct materials, either option can provide top notch energy efficiency. Opt for Low-E glass, don’t skimp on weather-stripping, and keep your doors well-maintained and in good working order. Still Not Sure? Talk to an Expert. Selecting the right patio doors for your Austin home shouldn’t be a chore. Whether sliding or French doors best suit your needs, we’ll help you get maximum enjoyment from our gorgeous Austin weather.